A Boeing 747-412F cargo plane was destroyed after impacting terrain near Bishkek-Manas International Airport (FRU). All four crew members and 35 persons on the ground were killed. Flight 6491 departed Hong Kong on a cargo service to Istanbul, carrying a load of 85618 kgs. An en route refueling and crew change stop was planned at Bishkek, Kyrgyzstan. Weather at Bishkek was poor with winds from 60°at 1 m/s and a visibility (RVR) of 400m at the beginning of the runway; 350m at the mid-point and 400m at the end of the runway. Vertical visibility was 50 m. Air temperature was -9°C, dew point -10°C, pressure (QNH) was 1023,9 hPa. The initial descent towards Bishkek was normal. The crew contacted Approach Control at 07:06 hours and were cleared for a descent to FL060 as per TOKPA 1 STAR (Standard terminal arrival route). The aircraft overflew the TOPKA reporting point at 07:11 at FL092 while in descent. According to the approach chart, FL060 or above should be reached when overflying TOKPA. Shortly afterwards the controller cleared the flight for an ILS approach to runway 26. At 07:12 the controller cleared the crew for further descent to altitude 3400 ft. The aircraft was meanwhile crossing FL074. The crew was busy monitoring the flight altitude and was aware they were higher than the STAR chart. The localizer was capture at 3600 ft agl. At that time the altitude should have been 1345 ft agl (3400 ft amsl). At 07:15:21 after the crew confirmed capturing the localizer, the flight was handed over to Tower Control. At a distance of 1.7 nm the aircraft reached 3400 ft amsl and the ALT HOLD OPER autopilot mode was engaged longitudinally. At that point the flight was already over 400 ft above the glideslope. The glideslope mode was armed (G/S MODE ARM), but the glideslope was not captured. At 07:15:31 while the aircraft was in level flight at 3400 ft amsl Outer Marker overflight was recorded (as per the approach chart Outer Marker overflight altitude is 2800 ft amsl). A glideslope signal was captured at 07:15:52, at that time the aircraft was almost over VOR/DME MANAS at a distance of approximately 1.1 nm from the runway 26 threshold, at an angle of approximately 9°. However, as per the approach chart, the rated glideslope angle is 3°. The aircraft automatically initiated descent with a vertical speed of up to 1425 ft/min. Six seconds after the glideslope capture LAND 3 autoland status annunciation was recorded. The crew called out the annunciation. At 07:16:01 at 3300 ft amsl the aircraft crossed the Middle Marker (as per the approach chart MM overflight altitude is 2290 ft amsl). After the glideslope descent was initiated the glideslope pointer was fluctuating within - 4 to + 4 dots. At 07:16:07, at 3150 ft amsl, AP CAUTION and FMA FAULT 2 events were recorded. These events were continuously recorded almost until the end of the flight. An FMA FAULT 2 means that the autopilot can no longer track the actual glideslope, but will track a constant 3° glide path until a valid glideslope signal is regained or until the crew intervenes by disengaging the autopilot or initiating a go-around. As the aircraft was descending LAND 3 status degraded to LAND 2, which was confirmed by the crew callout. LAND 2 means that the autopilot flight director system redundancy is reduced to the use of only two of the three autopilots. The EGPWS 'Glideslope' alert was then triggered 5 times. At 07:17:04 the flight crossed the runway 26 departure end at a height of about 110 ft. Decision height was 99 ft. The FO then called "Minimums" and the captain informed that there was no visual contact and called to go-around. At 58 ft radar altitude the TOGA switch was pushed and engine power increased. 3.5 seconds after the TOGA switch had been pushed the aircraft hit slightly upsloping terrain and obstacles. The ground speed at the time of impact was 165 kt. The maximum recorded vertical acceleration was 6 g.
Initial impact occurred at a distance of approximately 930 m from the runway 26 departure end. It collided with a concrete airport fence and rolled into a holiday village. The aircraft broke up and spilt fuel caught fire. It is recommended that the crews pay attention to following approach charts, monitoring distance and altitude during reference points (FAF, LOM, LMM) overflight when conducting ILS approaches, especially ICAO CAT II and CAT III approaches. It is recommended that flight crews be informed that in case ground references are not visible, go-around shall be initiated not lower than the established decision height. 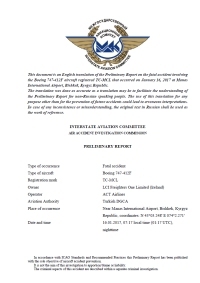 It is recommended that air traffic controllers, in case they have pertinent equipment available, inform flight crews on significant altitude deviations from that established by the approach charts, especially for ICAO CAT II and CAT III approaches and Low Visibility Procedures, therefore, introducing respective amendments to the procedures and job description of air traffic control personnel should be considered. It is recommended that top management of airlines operating Boeing aircraft (all models) arrange theoretical and practical (if needed) training to cover awareness, procedures and aspects of flight operations when A/P switches to inertial mode during glideslope descent. Consider the applicability of this recommendation to aircraft of other manufacturers. It is recommended that the FAA in cooperation with the Boeing Company consider the practicability of changing the A/P logic to prevent occurrences of following inertial glideslope descent (in LAND 3 or LAND 2 mode) in cases when approach path does not allow landing in the appropriate area on the runway. It is recommended that other certification authorities and aircraft manufacturers consider the applicability of this recommendation taking into account actual A/P algorithms. It is recommended that airport administrations analyze the acceptability of constructions in immediate vicinity of airdromes and, in case findings are raised, take appropriate decisions in cooperation with pertinent authorities. Distance from Hong Kong-Chek Lap Kok International Airport to Bishkek-Manas International Airport as the crow flies is 4269 km (2668 miles).